Fiscal policy – cutting taxes to boost AD. Education and training to help reduce structural unemployment. Geographical subsidies to encourage firms to invest in depressed areas. Lower minimum wage to reduce real wage unemployment. More flexible labour markets, to make it easier to hire and fire workers. 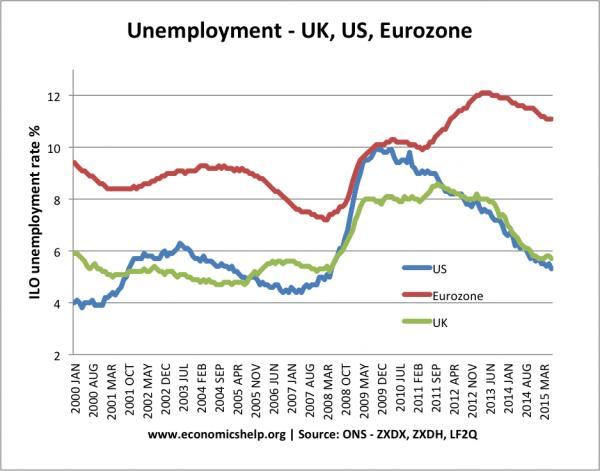 US and UK were more successful in reducing unemployment after 2008/09 recession. Fiscal policy can decrease unemployment by helping to increase aggregate demand and the rate of economic growth. The government will need to pursue expansionary fiscal policy; this involves cutting taxes and increasing government spending. Lower taxes increase disposable income (e.g. 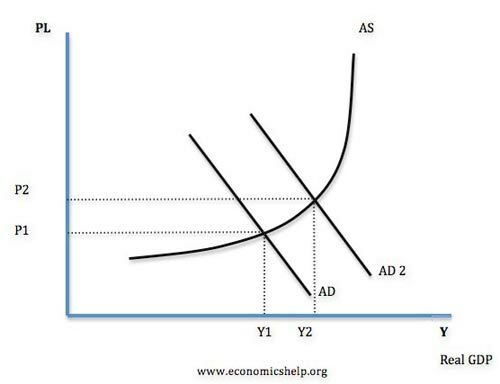 VAT cut to 15% in 2008) and therefore help to increase consumption, leading to higher aggregate demand (AD). With an increase in AD, there will be an increase in Real GDP (as long as there is spare capacity in the economy.) If firms produce more, there will be an increase in demand for workers and therefore lower demand-deficient unemployment. Also, with higher aggregate demand and strong economic growth, fewer firms will go bankrupt meaning fewer job losses. Keynes was an active advocate of expansionary fiscal policy during a prolonged recession. He argues that in a recession, resources (both capital and labour) are idle. Therefore the government should intervene and create additional demand to reduce unemployment. It depends on other components of AD. e.g. if confidence is low, cutting taxes may not increase consumer spending because people prefer to save. Also, people may not spend tax cuts, if they will soon be reversed. Fiscal policy may have time lags. E.g., a decision to increase government spending may take a long time to affect aggregated demand (AD). If the economy is close to full capacity, an increase in AD will only cause inflation. Expansionary fiscal policy will only reduce unemployment if there is an output gap. Expansionary fiscal policy will require higher government borrowing – this may not be possible for countries with high levels of debt, and rising bond yields. In the long run, expansionary fiscal policy may cause crowding out, i.e. the government increase spending but because they borrow from the private sector, they have less to spend, and therefore AD doesn’t increase. However, Keynesians argue crowding out will not occur in a liquidity trap. Monetary policy would involve cutting interest rates. Lower rates decrease the cost of borrowing and encourage people to spend and invest. This increases AD and should also help to increase GDP and reduce demand deficient unemployment. Also, lower interest rates will reduce exchange rate and make exports more competitive. In some cases, lower interest rates may be ineffective in boosting demand. In this case, Central Banks may resort to Quantitative easing. This is an attempt to increase the money supply and boost aggregate demand. See: Quantitative easing. Similar problems to fiscal policy. e.g. it depends on other components of AD. Lower interest rates may not help boost spending if banks are still reluctant to lend. Demand side policies can contribute to reducing demand deficient unemployment e.g. in a recession. However, they cannot reduce supply side unemployment. Therefore, their effectiveness depends on the type of unemployment that occurs. 1. Education and training. The aim is to give the long-term unemployed new skills which enable them to find jobs in developing industries, e.g. retrain unemployed steel workers to have basic I.T. skills which help them find work in the service sector. – However, despite providing education and training schemes, the unemployed may be unable or unwilling to learn new skills. At best it will take several years to reduce unemployment. 2. Reduce the power of trades unions. If unions can bargain for wages above the market clearing level, they will cause real wage unemployment. In this case reducing the influence of trades unions (or reducing Minimum wages) will help solve this real wage unemployment. 3. Employment subsidies. Firms could be given tax breaks or subsidies for taking on long-term unemployed. This helps give them new confidence and on the job training. However, it will be quite expensive, and it may encourage firms to just replace current workers with the long-term unemployment to benefit from the tax breaks. 4. Improve labour market flexibility. It is argued that higher structural rates of unemployment in Europe is due to restrictive labour markets which discourage firms from employing workers in the first place. For example, abolishing maximum working weeks and making it easier to hire and fire workers may encourage more job creation. However, increased labour market flexibility could cause a rise in temporary employment and greater job insecurity. Wow I Really Enjoy The Knowledge On How To Mitigate Or Reducing Unemployment.